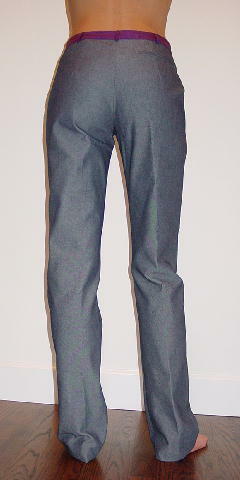 These never-worn (except for these pictures) pants were made in Italy by Alessandro Dell Acqua. One tag says 70% cotton and 30% polyethylene, and the other tag says 63% acetate and 37% cupro. 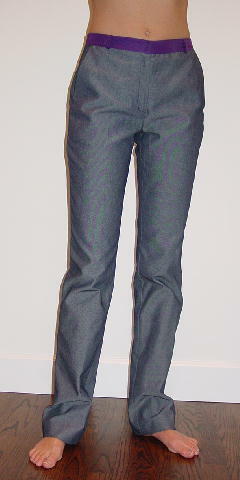 They have a dark gray denim-like appearance. There is a 1 1/4" wide purple waistband with a hidden snap front closure. They have a 5" long front fly zipper, diagonal front slash pockets, and a back horizontal slash pocket which is still sewn shut.